Nothing beats a well made biscuit. When I first started to get interested in cooking I spent a lot of time learning about southern comfort foods. I was raised by two generations of Texas women who grew up on southern food, so the food of my childhood leaned heavily toward traditional, stick-to-your-ribs fare. Biscuits were always a particular favorite of mine. Honestly I loved any and all bread, but fresh buttermilk biscuits really were my favorite. When I struck out on my own I learned that drop biscuits were the easiest to make, so they were the bread most often served with my meals. 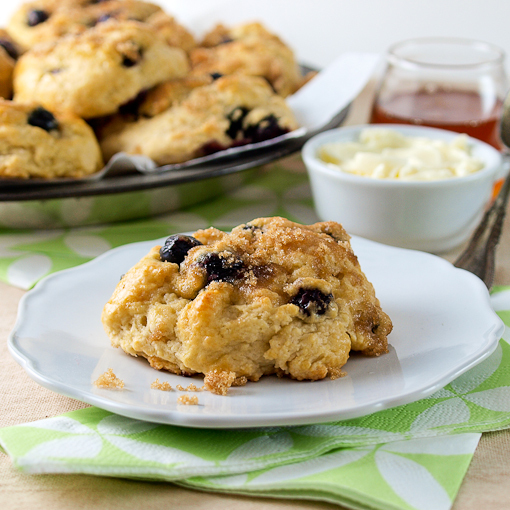 Similar to quick bread, with a drop biscuit you want to use a light touch when mixing, and they can be flavored in just about any way you can imagine. This time around I decided on a breakfast biscuit that is a cross between a blueberry muffin and pancakes drizzled with maple syrup. I am not usually one to demand that you use a specific product, but here I am going to be adamant that you use fresh blueberries and real maple syrup. 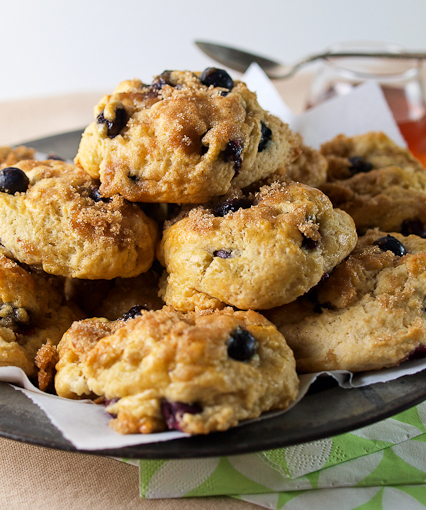 Frozen berries would be too mushy, and too watery, to make an appealing biscuit. Pancake syrup, which is nothing more than high fructose corn syrup laced with chemicals, lacks the unique, earthy flavor of real maple syrup. 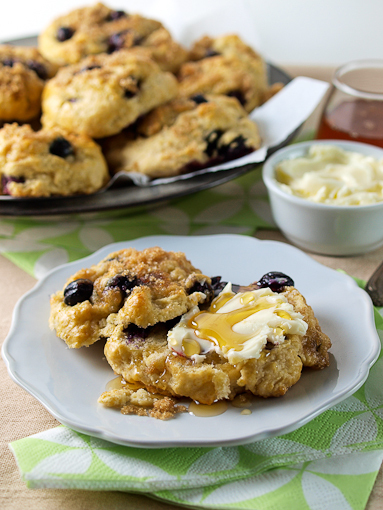 What makes these biscuits so good is the tangy, juicy berries surrounded by the fluffy, lightly sweet maple scented biscuit. To gussy these up I brush the tops with beaten egg and given them a sprinkle of light brown sugar. 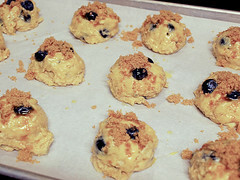 Visually the crumbly sugar and shiny berries are very attractive, and the crunchy sugar adds some fun texture. 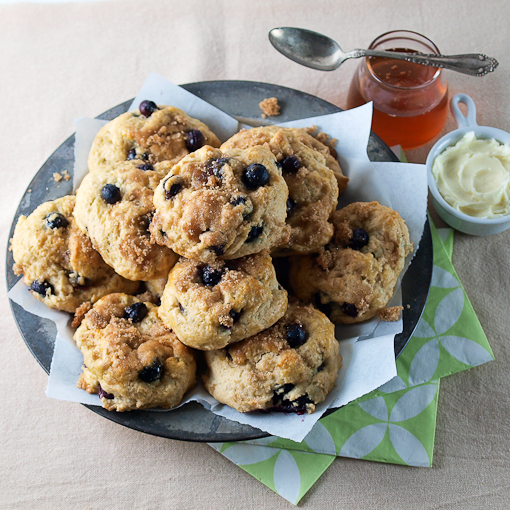 These are lovely all on their own, warm from the oven with a little salted butter and a drizzle of honey, but you can also freeze these for a qucik breakfast. Just reheat them in the oven for about 10 to 12 minutes at 350 F, or pop them in the microwave for a few seconds. 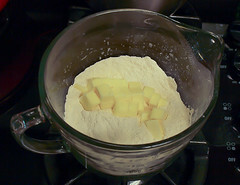 In a medium bowl combine the flour, baking soda, baking powder, salt, and sugar. Whisk until well combined. 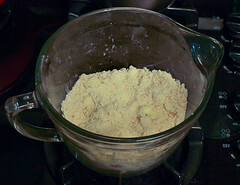 Add the cubed butter and, with your fingers, rub the butter into the flour mixture until it resembles coarse sand studded with pea sized pieces of butter. Set aside. In a small bowl whisk together the maple syrup, buttermilk, and vanilla. 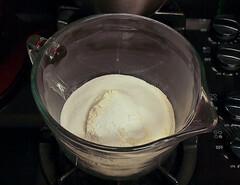 Pour the wet ingredients over the dry and stir until most of the flour is damp, about 6 strokes. 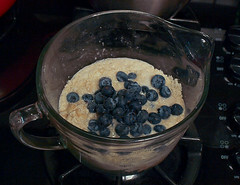 Add the blueberries and stir to distribute and combine the remaining flour, about 4 to 5 strokes. Do not over-mix. Scoop the dough onto the prepared baking sheet using a large disher (mine is about a 3 tablespoon capacity disher) about 2 inches apart. Brush the biscuits with beaten egg then sprinkle brown sugar over the top. 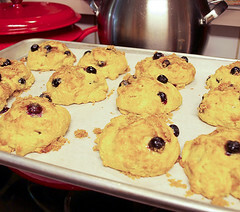 Bake for 15 to 18 minutes, or until the biscuits are golden brown and spring back with gently pressed in the center. Cool for 10 minutes on the pan before serving.